di Bocconi Students Investment Club 22 Settembre 2017 8 min. Recently the spread between oil benchmark Brent and Us counterpart West Texas Intermediate has reached the highest levels in two years, breaking above $7/bbl in September. 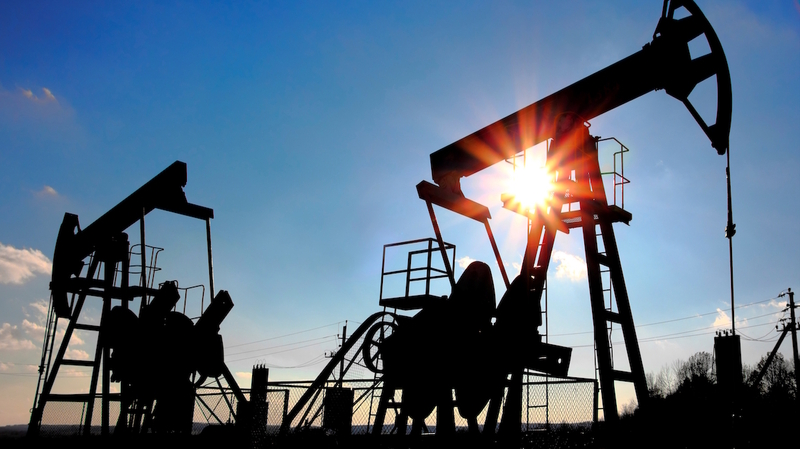 In this article we will give a brief introduction of different crude oils, the fundamental reasons behind price differentials, and an idea on how it could unfold in the near future. Brent Crude oil, refers to oil extracted from oil fields in the North Sea: Brent, Forties, Oseberg and Ekofisk. It is considered light and sweet, making it ideal for refining into gasoline. Brent oil due to its nature of being waterborne makes it is easier and less costly to transport to distant locations. It is used to price two thirds of the world’s internationally traded crude oil supplies. The West Texas Intermediate is extracted from oil fields across the US and sent via pipeline to Cushing, Oklahoma where it is stored. It is sweeter and lighter crude than Brent. However, it is landlocked, meaning that it needs to rely on the capacity of pipelines and rails in order to be transported to refineries in the Gulf coast. This makes transportation more expensive. WTI continues to be the main benchmark for oil consumed in the United States. Prior to 2011, the spread between two benchmarks traded at $2-$3 premium in favour of the WTI. There was a greater supply of Brent crude as as the production in US, i.e. the WTI, was relatively low. In addition, Brent having a higher sulfur content was more expensive to refine into gasoline. In December 2010, the Arab Spring, a series of anti-government protests, uprisings and armed rebellions spread across the Middle East. Moreover, a civil war started in Libya and escalated in February 2011. These events created concern and worries about the instability in these regions. 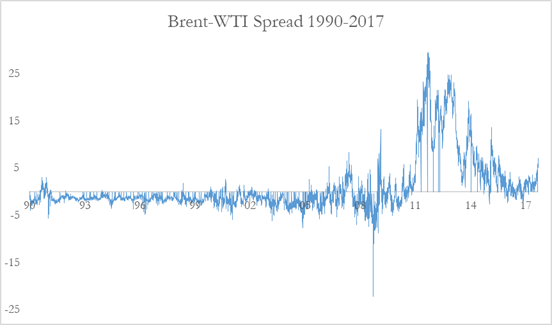 It caused volatility in the oil market and the price of the Brent crude rallied relative to WTI crude, reason being the concerns on the availability of supplies and logistical considerations, e.g. possible violence on seaway passages. At the same time, US oil production started to rump up and determined a weakness in the WTI. For these reasons, Brent crude traded at all time high premium of $27,7 per barrel relative to WTI. Later, in 2015, the US government removed the ban for crude export, allowing companies to export crude for the first time since 1975. In combination of the proliferation of pipeline capacity, that made the transportation of crude less costly, the spread between the two benchmarks started to narrow. Over the past 18 months, the spread has traded in a relatively restricted range of about $2-$3 a barrel. In last month though, it escalated reaching a maximum level of $7.11 due to Hurricane Harvey. The natural event created distortion in the crude oil market; it initially affected a third of US oil refineries forcing them to stop operations. This caused a temporary surge in Gasoline price and a decline in WTI, that quickly adjusted when refineries restarted operations. On 12 September WTI rose above $50 and Brent crude hit the highest level since April. Up to now, we discussed the situation only in US and Middle East, that together with Russia represent the global supply of crude. To get a deeper insight we shall look into a huge Eastern market that cannot be ignored by any investor interested in commodities: China. This highly industrial country has been the key driver of commodities demand for the last decade and its decline in growth rate from a double digit to a “mere” 6% has brought down industrial commodities prices like copper, nickel, lead, zinc, aluminum and so on. Recently though, this commodity-behemoth has started stockpiling commodities once again, including Brent crude. Why? For the upcoming party Congress in October, an opportunity for President Xi to unveil its latest economic program of stable growth. Many expects a strategy in preparation of the not-impossible armed conflict between North Korea and the United States, either in terms of joining sides or for eventual disruption of raw material shipping lanes.